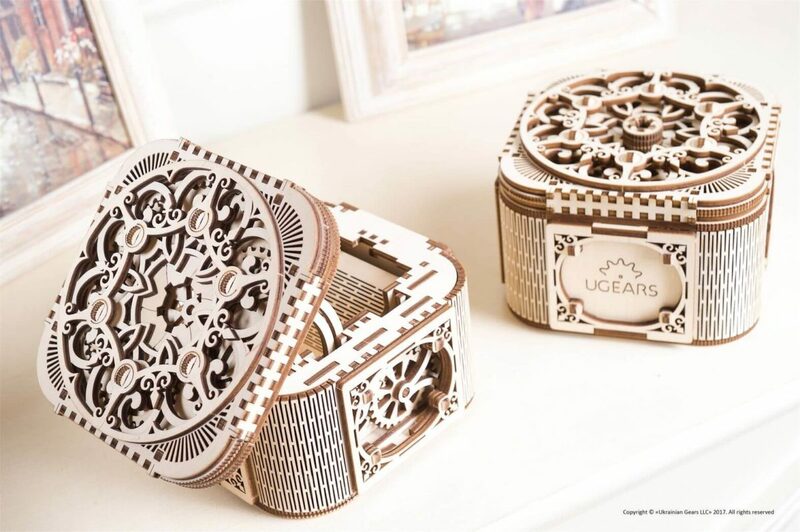 Another jewel of UGears collection of wooden models is an exquisite Mechanical Treasure Box. Beautifully crafted, this item is more than just a puzzle and sophisticated storage. The delicately carved lid and sides invite you to take a glimpse into the mystery of moving parts and mechanics in action. 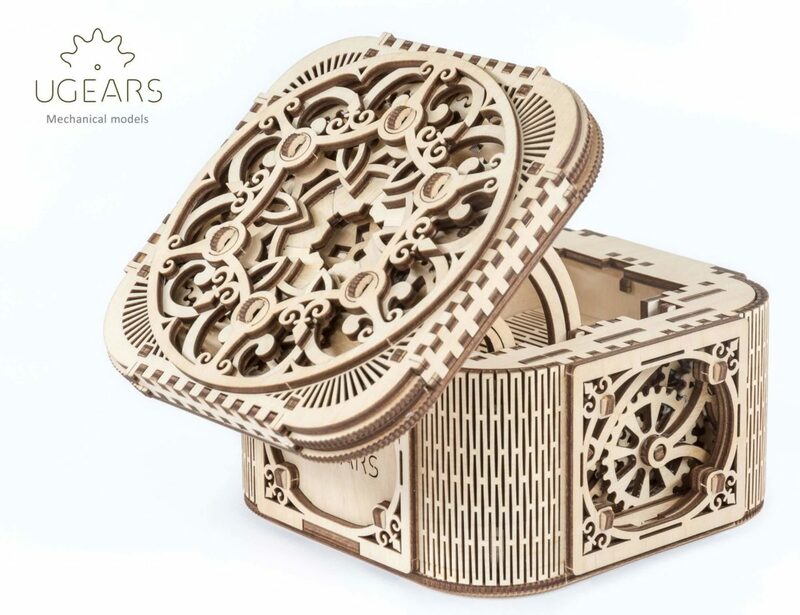 The box is opened with a turn of a key that is beautifully embedded into its carved lid. 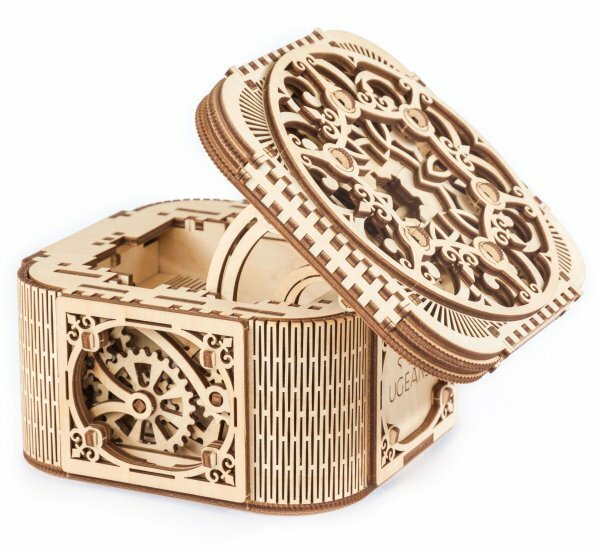 Mechanical Treasure Box can hold small items such as jewelry, a flash drive or a set of keys. To put something inside this box or reveal its content, spin the wheel gear toward yourself of press on the hand lever. 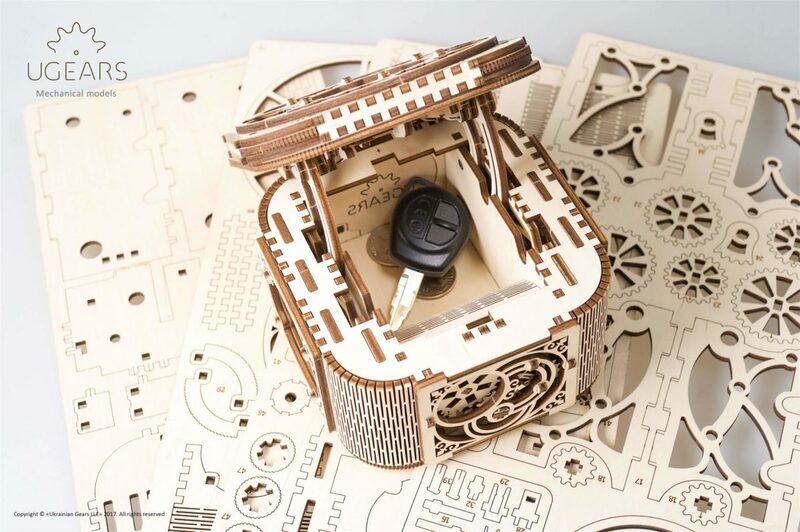 Either will activate the Mechanical Etui Box’s internal mechanism, lifting the box slightly upward and opening its lid. Hold your finger on the hand lever a bit longer, and the lid will start closing, the small compartment – lowering, and the wheel gears – spinning in the opposite direction. Valentines present for my husband. Prompt delivery got it in time! We started building it that night and finished it on Friday. Lots of fun for the both of us and he loves it! Fantastic product. 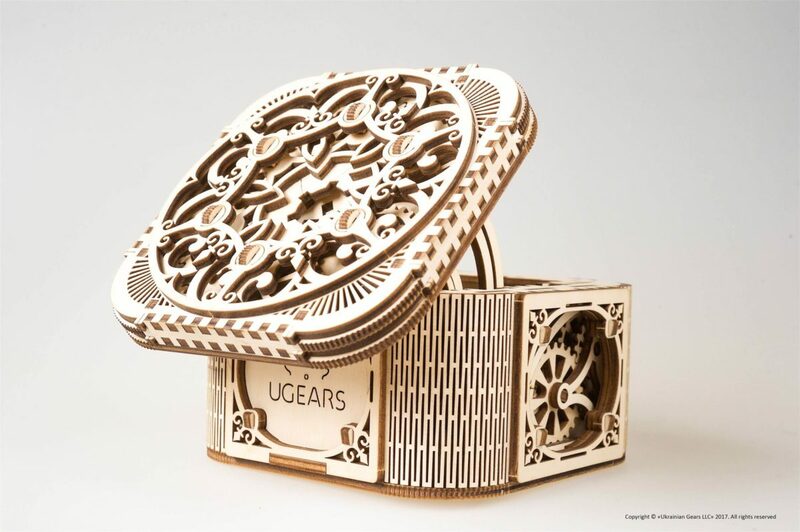 I’ve made a number of UGears’ assemblies by now, and this was my most elaborate to date. It went together beautifully, following the instructions. DO wax whatever pieces they advise waxing! I used a lit beeswax votive candle and a q-tip for most of the waxing, and scraped off excess wax when it had cooled. It also helps to work the mechanisms thus far as you assemble, to make sure they move smoothly. I am inordinately pleased with myself for successfully assembling this! 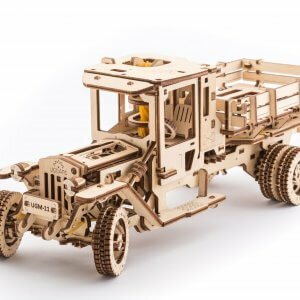 It was engaging and a lot of fun, for those who like assembly and mechanisms. And, when done, it’s gorgeous! It’s really gorgeous when assembled! I could see staining some of the parts to add a bit of color, but it’s lovely as it is. Please note that it took me far longer to make it than the approximate times listed! But that was because I made sure each part was smooth, and the mechanisms worked easily. For me, assembling isn’t goal-oriented; it’s about the process, and rushing through it makes it feel more like a JOB! So I take my time and enjoy each step. I’ll be starting the hurdy-gurdy soon! I ordered this kit and 2 others to build while RVing and am pleased to say they are great. This treasure lock box was not only fun to build but my grand children think it is the best. My 3 grand daughters each want one so needless to say I’ll be getting 2 more boxes to build. What impressed me was the clean cuts of the parts and the fact that some fragile pieces had extras included in case of a mishap. Terrific kit and fun to build. Took a few hours too build but was the best one to start with. I moved on to the truck and then the race car. All three are great. I leave tomorrow too camp again and the grand prix car kit is going with me. 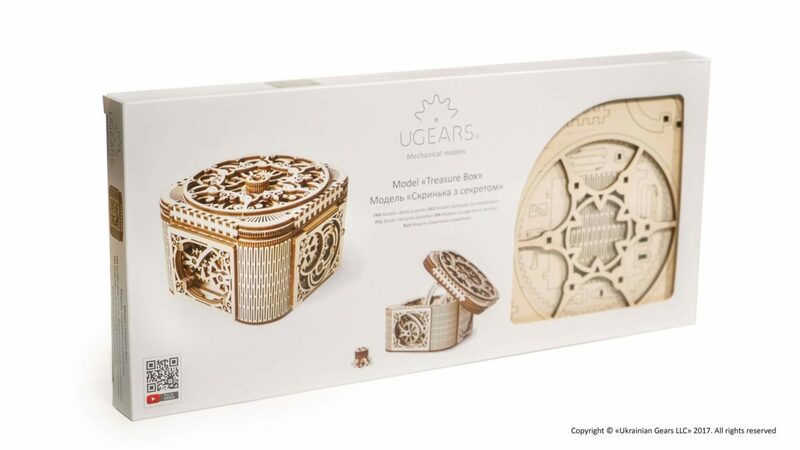 Great job Ugears. I you are looking to be original in gift-giving The Treasure Box is your choice. 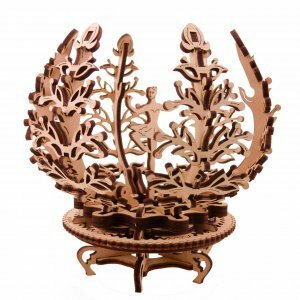 It is very different from all the similar items not only in its design, but also in a very idea of making it a puzzle first. My only concern is materials the box is made off. 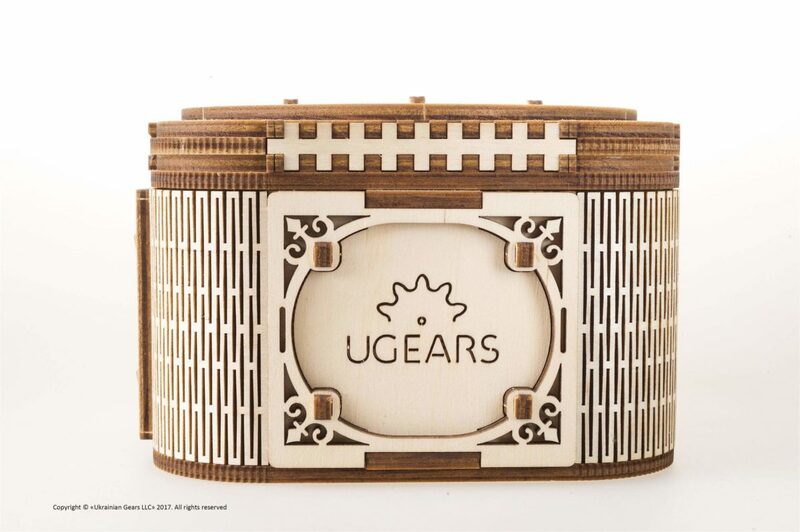 It is crafted from what appears to be a hight quality plywood…wonder if its durable and sturdy enough to serve as practical purpose of jewelry box. 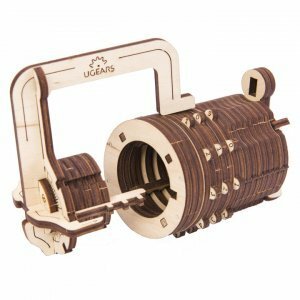 I was looking for gifts for my mother and sister-in-law for Mother’s day and came across several Ugears items on Amazon.com. The choice fell on Treasure Box. I loved the idea of unusual jewelry box, but was pleasantly surprised by the extra fun it offers: you actually have to put it together yourself! This was unexpectedly interesting and unique. The box itself is super pretty and neat. Its is very different from other jewelry boxes because of its design and the way it operates. Made a nice addition to my work desk ( I work a lot form my home computer, and things I surround myself with inspire me). 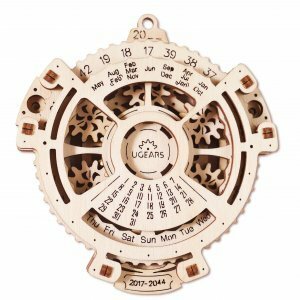 I will be checking website for deals to buy another one of these wooden models.